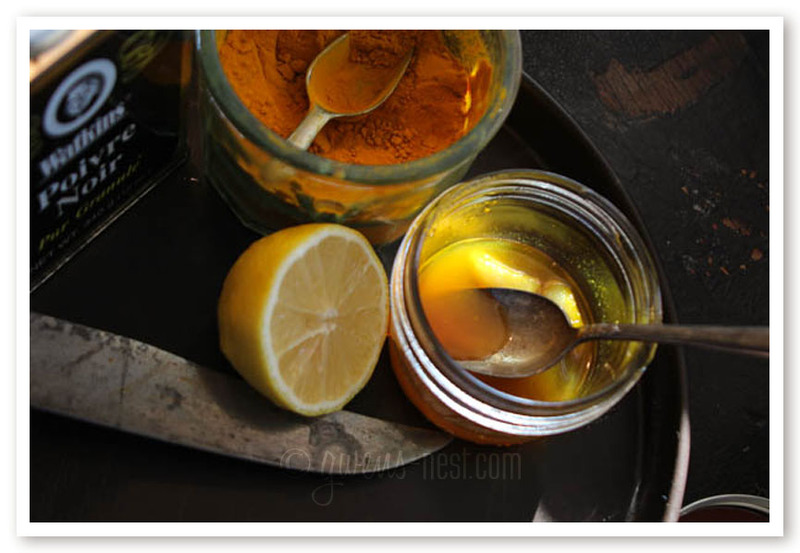 If you’re thinking this cough remedy recipe looks familiar, then you’re right! It’s actually the same picture that you’ll see in the cough and cold remedy post, but for good reason. You start with that recipe as the base. After you make up the honey, lemon, ginger mix put together, you’ll just need two more ingredients to turn it into a really great cough kicker…and you may already have these ingredients in your spice cabinet! Worst case scenario, you’d have to go to the local grocery store to pick them up…but you won’t need to wait for something to be shipped from the far corners of the earth. Convenience is key when you’re not feeling good. The first thing you’ll need is turmeric. It’s really a wonderful spice, and I wrote a long post about it here and a really short one here. They’re part of the ‘remedies you may already have in your kitchen‘ series. Turmeric has a warm, peppery flavor, and is one of the key ingredients in Indian curries. It is an anti-inflammatory, and a histamine blocker. So if your throat is swollen and irritated, it is a great pick. You may remember that I wrote about using turmeric in the series on Whooping Cough. It was amazing how quickly this humble herb quelled a terrible cough that had been plaguing my kids for weeks! To about one cup of your base recipe, add 1-2 teaspoons of powdered turmeric. And there is one more secret ingredient that you want to add to your cough remedy. Just a pinch has an amazing effect on your body’s ability to metabolize and absorb turmeric. Black pepper increases your body’s ability to absorb turmeric by 2000%. That’s not a typo! Two-thousand percent.That is significant. (References for the study on this are in the longer article above. )Admittedly, this combination is not as tasty in a sugary, lemony, nummy way. It takes on more of a savory flavor when you add the turmeric. But my crew tolerates it well, and definitely see a difference in using it. In fact, my toddler really, really liked it, and would ask for it often. Dosage: Once you’ve stirred in the turmeric and a pinch of black pepper, use just a spoonful as often as needed to calm coughing. Alternative: If your kids refuse to touch the turmeric, then you can sub cinnamon in the recipe (and omit pepper). Warning: Children under a year old should not be given honey. If you have a little one, then use maple syrup as an alternative base for this syrup recipe. 2 fresh or frozen garlic cloves- don't use the pre-minced stuff. It's lost its strong medicinal properties. 2 t. turmeric powder--or 2 chunks of fresh root, sliced, if you're lucky enough to find it! Fill a small jar halfway with raw honey. Raw honey has active enzymes, 'good' bacteria, and tons of other beneficial stuff that normal, pasteurized grocery store honey doesn't have. Squeeze the lemon half into the honey and stir. Do the same thing to the ginger. Drop them into the honey and stir. Add powdered or fresh (pounded) turmeric, and pepper to the mix. We store this in the fridge, because the cold feels good on hot, scratchy throats. I love the taste of fresh ginger, so whenever I buy some for a recipe, I will chunk up the rest of it into one inch pieces and freeze it for using in remedies or for cooking. I also buy bulk peeled garlic cloves, and keep them in my deep freezer. I keep a smaller container of them frozen in my kitchen freezer for convenience. If you're lucky enough to have good, multi-cultural grocery stores in your area, you may be able to find fresh turmeric root, which is really delicious! It's got a lemony-gingery flavor. It also keeps well in a sealed container in the freezer. been trying this for two days now – I had developed a little cough/tickle 2 days ago and saw this on pinterest. my husband gets a chronic cough during winter and he is also taking it – so far I’m doing better except I’m suffering from ear pain as well. Glad you’re enjoying the cough remedy! Cinnamon is another good addition to this. Sorry about the ear pain…this years cold seems to be wanting to settle in the ears here too. Have you tried this ear infection remedy? It works really well here! We usually use Delsym for coughing but my husband didn’t tell me we were out. So, my 4yo has croup and had been coughing all night. I got the last tablespoon of raw honey and put about 1/32 of a teaspoon of tumeric, minced garlic juice, lemon juice (from a bottle) and then a couple “grains” of pepper. Oh, and 1/16 t of juice from minced garlic…. Stirred it up and put it in a medicine syringe. Had to bribe him with 2 bites of ice cream afterwards. BUT although I would have preferred all natural, organic, etc… these were all just your typical spices. And he was cough FREE for 6 hours. Just wanted you to know that it worked. THANKS! LOVE reports like this! 🙂 SO glad you both got good rest, and that he got relief. I’ve been using this for the last 24 hours and it is helping! Thank you! Wonderful! So glad it’s helping! We are fighting cold/flu here, and have been using herbals the whole bout. We’ve been dosing up on elderberry syrup, putting 2 teaspoons in dd’s sippy cup and filling the rest with water. I made the honey/turmeric syrup last night and added 1 tsp of cinnamon to it this morning. We all feel pretty good today. My being ‘sick’ lasted last night and this morning, both of the kids are almost 100% after just 2 1/2 days. Colds usually lay us low for a solid week. We also used garlic oil on the kid’s chests and feet, and an onion/salt poultice on their chest over night to calm nighttime coughing. 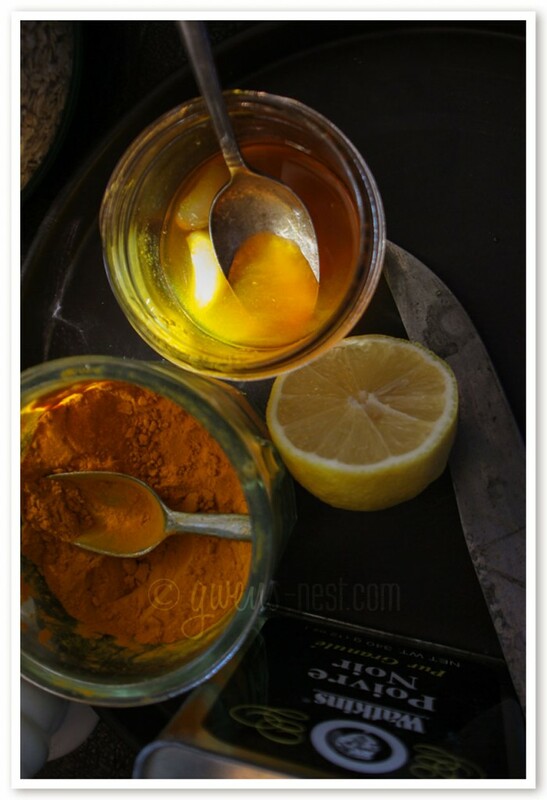 Check out my Home Remedy Cheat Sheet and Flu Remedies posts too! The cheat sheet is awesome because you can jot your own notes about what worked well for you, and have it at your fingertips next time someone starts to get sick. Thank you, thank you, thank you for this. It has helped so much. My daughter has Reactive Airway Disease and has caught every single respiratory infection this winter. She had a 2.5 month long bought of bronchitis brought on by two colds. I had finally cleared that up with fish oil, elderberry, echinacea, mullein, honey, and lemon oil, but this last week her brother brought home another cold. She’s been coughing nearly non-stop, and our earlier regime isn’t touching it. And I am soooo tired because her coughing is keeping me awake. I’ve given her two doses of this and her coughing has calmed and her breathing has slowed down. Thank you soooo much! I’m so happy that this is a help to you! It was a big help for us as my kids recovered from whooping cough a few years back. It’s good stuff! How often can you give this to a three year old? It worked very well at night, for 5 hours each dose, but now that she’s awake it seems to be wearing off faster, working about 2 hours. I’m using it in conjunction with a licorice tincture to help with bronchial swelling. I am comfortable dosing it as often as they want to take it. Mine would come ask for it. It’s all food based ingredients, so there were no concerns for me. You may want to refresh the garlic to get more boost to the potency. Okay, sorry for flooding for comment section, but I’m just so excited. After a week of having a cold my daughter isn’t wheezing and rattling anymore thanks to this stuff. That’s unheard of for her; last time she got a cold she had bronchitis for 2.5 months. So this is my next question. Can I use this as a preventative? I was thinking the turmeric would be good to keep the bronchial restrictions away. Oh, I’m THRILLED for you! That’s fantastic! I would think using it as a preventative would be fine…or you can just incorporate these foods more frequently. You can also just get 5oo mg turmeric/curcumin complex capsules at Sam’s Wholesale. “Members Mark” is the brand name. I take them two at a time. Wash them down with a half cup of milk with a fat pinch of fine-ground black pepper mixed in. This is a truly amazing cough remedy. It’s also great for bronchitis, copd and asthma, all of which can produce a nagging cough and/or throat clearing. Is by no accident that turmeric is on this planet. It is a gift from the Great Physician to ease our suffering in this life. My daughter 4 wasn’t sick, but woke every morning with a phlemy cough she had to clear and it seemed to be getting worse. I mixed this up (had to bribe her with a jelly bean to take it) and two days later, no cough! Now I have so much of it. Do you think I could store it in the freezer to prevent it from molding? Would that destroy its properties? Maybe strain it first? You can strain it and push it to the back of the fridge…honey doesn’t usually mold because of the high sugar content. I’ve never tried freezing it. I currently have whooping cough, and have just made a batch of your syrup. Once I’ve added the ingredients, should I let the mixture sit in the fridge for a few hours before consuming? The active antibiotic in garlic is most potent within an hour or so of cutting/crushing, but it retains the anti-inflammatory properties long after (which I think are actually most beneficial at the coughing stage of pertussis). Hi. I am sitting up at one a.m. as my daughter coughs and coughs. I will definitely try this for her. Thanks for your blog it has answered a lot of my questions. Question, the raw honey in have is almost always solid, how do you stir in the other ingredients without heating it up? Or can I, just a little bit to get it flowing? My older son went surfing a day or so after Christmas, within 2 days of it raining-a big no no, because of the toxic run-off. But, hey, the waves were perfect! A day or two later he got really sick, and this is a kid who almost never gets sick. Then, word got around about three local surfers who went in the same day, same beach, and all three got sick, one died from a MRSA infection and another nearly died. We all began thinking that maybe it was more than a bad cold or flu. I’d just seen a post that day about making up the Master Brew, but that takes 2 weeks to brew. Besides giving my son some homeopathic remedies, I suggested he make up a modified Master Brew. Great minds must think alike, as I just saw your post tonight, and see that he made up an almost identical mixture, though the proportions are probably different (He really likes things hot and spicy!). We didn’t have any ginger (thanks for the tip on freezing it, btw), but he also added a generous portion of ground cayenne pepper and Apple Cider Vinegar to the honey, lemon, garlic, turmeric and black pepper. I had a couple other kids coming down with sore throats and colds, since we’d just gotten a cold snap, so they tried it, too. It has become their favorite drink now, and my son enjoys the daily ritual of making this brew. It’s a nice combination of sour, sweet and spicy. (I’m just thinking here-I wonder if some Pink Himalayan Salt might be a good addition, too?) We have not had any leftovers, and all of us like to eat the chunks of minced garlic, because, yes we do like garlic-a lot! Everyone, including my son, felt markedly better that same day. He seems to be over it, now, and I think this brew helped immensely. I like the fact that we had everything in our kitchen already, it hardly cost anything, it tasted good, so my kids would actually take it..and it worked! When you say blend well does that mean in a blender? I’m a bit confused! Thanks! Would this work just as well without the garlic? My daughter is allergic to garlic but I really need something for her and her brother’s coughs. Hi Gwen, thanks to a friend, I was introduced to your blog. Thanks for the great information. Are there different types of raw honey? I have a little left, but it doesn’t look like regular honey. I just found your post tonight as I have been researching Whooping Cough. Eight days ago I visited our local clinic because I had a choking cough so severe I was throwing up. No mention of Pertussis by the nurse practitioner. I took the antibiotic prescribed but found the cough suppresant she prescribed totally obnoxious. One dose made it impossible to move the sticky phlegm I felt in my throat, but left me desperately wanting/needing to cough. Who thinks this stuff up, anyway? I NEVER go to doctors but was panicking because I have a singing gig coming up in a week. Back in late Dec. I had similar paroxsysmal bouts of coughing that lasted three weeks. I took a similar tea to your recipe (lemon juice, ginger, cinnamon, honey and cayenne) which helped a lot, but still took 3 weeks to clear. I missed several gigs then. So at work, while on ABX for my cough, a woman mentioned to me that her team of ER nurses had once all contracted an”aberrant form of Pertussis” and had a long lasting cough that sounded like mine, I am presuming she meant B. parapertussis. She recommended heavy duty ABX, an intramuscular steroid shot and prednisone. I did some research and now believe I have indeed contracted Whooping Cough (without the “whoop”). I distinctly recall the sharp sore throat I woke with two mornings before the cough began with fever. In my readings it appears to be inexplicably common for medical professionals to NOT diagnose Pertussis! Had I known, I would not have made my weekly Meals on Wheels deliveries to my aging and sick clients, NOR would I have gone to my part-time job weaving at the children’s home! I suspect I picked up this nasty bug from one of our student assistants who said she’d just been diagnosed with walking pneumonia. (I’m wondering if she might have had undiagnosed B. Pertussis first!) Last thing I’d want to do is pass on something so contagious as Whooping Cough to other children (or adults). Within days of my getting sick, my grown son and husband are now coughing (and had the sore throat to start.) What a journey this is getting to be. I am wondering if, in your own research you have read that it is possible to have the same bug, Pertussis in a six month period. This seems really strange, I am 71 years old with a usually very strong immune system. I’ll post if I find your remedy really does quell this cough in time for my band’s gig Friday. I don’t think I’ll go back to the clinic, though I may call and have a polite conversation with that N.P. I did the course of antibiotics, but will NOT go back for another round and an xray as she suggested would be next. Thanks for your very useful and helpful blog entries, Gwen. Generally there is a longer incubation time for the pertussis bacteria, and it presents with mild cold symptoms for anywhere from 7 days to 3 weeks (although there is a range as low as 4 days, but that’s rare). It was called “nurses cough” because it’s generally a lot more mild in adults, and would often go undiagnosed for long periods, like your friend said. It’s also possible that you have a different infection or a different strain of pertussis. This Pertussis handout from the Health Department in California has more info on both. Essentially, I’d treat in a similar way if your symptoms are similar. More than likely, you’re dealing with lungs that have some damage from infection, and the cough syrup and the stew should both be helpful in supporting your body while it heals. Ive had this on and off cold for the past month with a very dry whooping cough. Taking cough meds make me hallucinate so i decided to go natural. Found your site and tried this remedy and stopped coughing the same night. I took 5 tbls throughout the whole day. Should i keep taking it for a few more days just to make sure it doesnt come back? Still trying to stop the stuffy nose too. This is really a nice, effective, food based remedy…so you can take it as often as you like whenever symptoms return. 🙂 Glad it worked for you! a spoonful in a cup of hot water makes a nice tea for sipping…. My daughter thinks cinnamon would be good in this recipe. Does cinnamon have any contradictory reasons you shouldn’t add it? Cinnamon IS great for coughs, but I’ve added it to my Elderberry recipe and the cough syrup before and it just makes it unpalatable to us. In a pinch, here are four other easy and natural cough remedies that I also have used, and one of them is a yummy cinnamon concoction! This is a guest blog of Natural Cough Remedies on The Prairie Homestead blog. Okay so far in the year 2016 I have had 2 bouts of whooping cough. 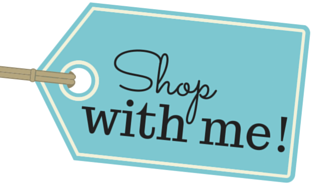 I have missed tons of work, sleep, recreational activities and necessary errands during this time. The coughing fits get nasty and the spasms make me just wanna curl up an die. I gasp for air, choke and have a raspy voice for hours at a time. For an English teacher this is not good. Tried all the remedies out there: inhalers, steam, nebulizing, antibioitics and antihistamines. Nothing. Honey and lemon, Nothing. Online remedies from the fluff I googled, NOTHING. So you are my last hope. I followed the recipe and had my first dose 8 minutes ago. The first thing I did was come here and email you. I am crossing my fingers since I am so run down by this that I know no other source of help. Hope this helps, Adela! You may also look at a formula called AsMa from Trilight Herbals. It’s a blend of herbs that have historically been used for rebuilding the lungs. Long term, using digestive bitters after means can help with this too. (see this post) In the short term, believe it or not, warm onions can really help bring down the inflammation in the chest. It’s an old timey remedy, but it works well. I wrote about why and how here. As far as I know, Whooping cough can hang around for up to 100 days, but then you should have long term immunity. Generally, adults and older kids get much milder cases. I would check with a doctor to try to figure out another diagnosis, because whooping cough doesn’t seem to fit what’s going on with you. Hope you are on the mend soon! I’ve been using something very similar to this but I add dried thyme I’ve ground up. Thyme is antibacterial and helps the respiratory system, among other things. Do you peel your ginger? Thanks! LOVE the idea of slicing and freezing!!! My oldest son has whooping cough and my middle son is showing signs of coughing now. I came across your blog in the early morning hrs completely exhausted from the constant interrupted sleep due to my oldest coughing fits throughout the night. We’ve been up every hr to hr and a half at night. NOTHING has been helping. So through my tears last night I stumbled onto your blog and I’m headed to the store this AM to get everything I DESPERATELY NEED to make this cough syrup. I’m 30 wks pregnant so I’m really wanting to kick this whooping cough in the bud. For the sake of my boys now so they can get some relief from this nasty, nasty bug and for the sake of this pregnant momma who desperately needs rest. My children LOVE yogurt. Did you limit the intake of dairy from your children when they had whooping cough? I did…dairy seems to cause my kids to be more phlemy, so we took a dairy break. The lack of sleep is the hardest part…bless you Mama! I woke up with a horrible sore throats and tight cough. I looked up natural remedies for my symptoms and found you. I’m looking for relief . It looked like the perfect answer. I had a really bad dry cough, it was so bad that I felt my throat was cut with knives every time I coughed. 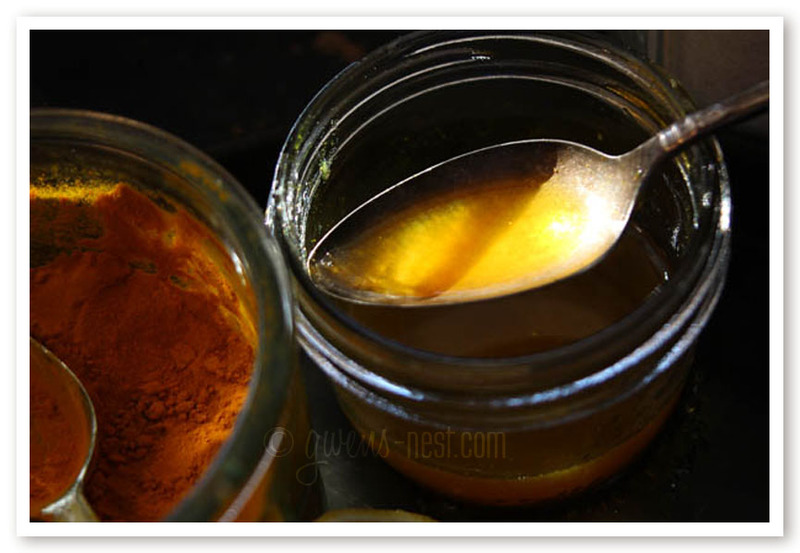 I mixed 1 tsp of turmeric with 2 tsp of good quality clear honey, and took a tsp every hour. The cough stopped immediately after taking the first spoon. Try it its amazing. Thanks a TON…for your help. Not even the day has passed and I’m feeling good now. Is there a reason this wouldn’t keep longer than a few days? I don’t put it in the fridge. Thank you for all this information! Our summer came to a screeching halt when pertussis struck. I’d love to hear how long it was before others considered themselves 100% again/completely recovered. I choose to refrigerate mine, so not sure how long it keeps outside the fridge. It’s called the “100 day cough” in oder literature, if that gives you any idea. We started treating late in the game for my oldest 3 who had been couging for months, and it took about 2 weeks after we started with nutritional support and the cough mix to not have any more coughing. The baby had just come down with it, and iirc, it was about a month of nutritional support for him to be back to normal. But I feel that the nutritional support cut recovery time significantly for him. I was rereading your comment on freezing fresh ginger. I’m assuming you peel it first? Is a zip lock freezer bag sufficient to keep it in or should it be a glass container? Thanks so much for all your tips! Got instant relief from cough. Thanks for sharing the cough remedy. This is much better than intake of medicine or tablet. Best Home remedy to get rid of Cough.